Tube-Free Toilet Paper - Pros and cons? 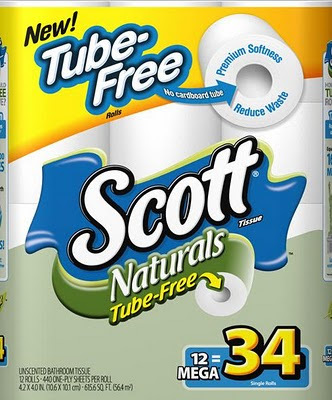 Kimberly-Clark recently introduced the latest and greatest in bathroom technology: toilet paper rolls without inner cardboard tubes. So I thought I'd take look from the usability perspective - how does this score? -Less waste (K-C says tubes make 160 million pounds of trash annually). -You can use that very last square because it isn't glued to the tube! -You don't need to change anything else about your TP routine, it's all backward-compatible (ha). -Everything we use that leftover TP tube for! I'm sure there are countless household uses from spacers to storage to kids' projects. I guess we'll just have to live with paper towel tubes - until they nix those, too!